Sometimes all you need is a place to lay your head after a long journey or a day on your feet, exploring your destination. But sometimes, the place where you call it a night is a destination in its own right – quirky, unconventional or even downright wacky. From a vast collection all over the world, these are some of our favourite, off-the-wall places to sleep. From a converted former silver mine in Sweden to a boutique hotel carved into the volcanic caldera of Santorini, there’s a surprising number of underground abodes to choose from, and many of them sit at the ultra-luxurious end of the scale. One of our favourites is the Kagga Kamma Nature Reserve, in the Western Cape Province of South Africa, whose skilfully-carved suites seem to be a natural part of the surrounding sandstone landscape. Set within a private game reserve in the Cederberg Mountains, during your stay you can enjoy hiking, take nature drives in search of rare and fascinating wildlife, study 6,000-year-old rock art and at night, take advantage of the clear night skies for some guided star-gazing. Relive your childhood by spending a night up in the branches, but in a much more luxurious setting than anything you might have constructed in the backyard. Set in the forested hills behind Phuket’s Kamala Beach, Keemala feels like a world away from the buzz of nearby Patong. From the teardrop-shaped Tree Pool Houses, which are furnished with suspended, cocoon-like loungers and outdoor showers, to the Bird’s Nest Pool Villas, whose private pools sit ingeniously-perched on stilts, this resort is like no treehouse you’ve even imagined. Unwind and forget about the stresses of everyday life as you soak up the ocean and forest views, indulge in wholesome but delicious cuisine and treat yourself to a range of rituals in the on-site Spa. 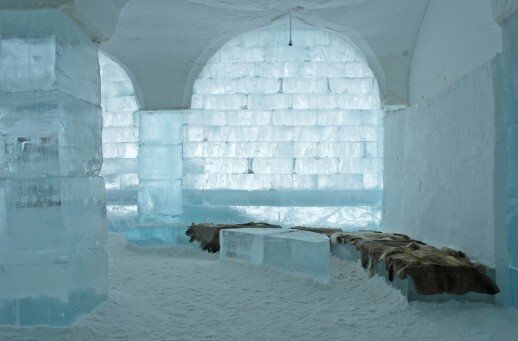 From Romania to Quebec, there are now ice hotels scattered across the globe, and while each offers its guests a unique and unforgettable stay, we have a soft spot for the original Ice Hotel, which is freshly-constructed every year on the banks of northern Sweden’s Torne River. Because the hotel is built afresh every December, it’s different every year, but some details remain consistent: beds are swathed in cosy reindeer hides and polar sleeping bags to protect sleepers from the icy chill, many of the details are hand-carved from locally-sourced ice, and every room is an utterly unique work of art – created by skilled artists who must first submit their designs for selection. The hotel’s restaurant provides a cosy retreat from the ice, as well as the chance to sample from a menu that features plenty of unusual local delicacies, from fillet of reindeer to arctic brambles. Bringing a new and improved meaning to the expression, “sleeping with the fishes”, underwater hotels have been appearing in various locations over the past decade, providing guests with unparalleled access to their location’s sub-marine scenery without getting their sandwiches soggy. The Underwater Room at Tanzania’s Manta Resort is a floating, three-storey pontoon, where the furnishings are relatively simple and rustic, but the setting is incredible. The rooftop level is a lounging area, so you can soak up the sun during the day and gaze at the stars at night, while the main, above-water level consists of a lounge and bathroom, from which a ladder descends to your underwater bedroom – the ideal spot to observe the surrounding, vibrant coral and its inhabitants. Although you wouldn’t normally consider spending a night behind bars to be the mark of a successful holiday, it turns out that former prison buildings can be repurposed into remarkably luxurious accommodations. In the UK, the Malmaison hotel brand has taken its name quite literally (it means “Bad House” in French) in one instance: a boutique hotel in what was once a Victorian jail. Its grim, brick façade in the heart of the charming city of Oxford conceals a selection of vibrant rooms and suites, and although you’ll still find porridge on the breakfast menu, you can be assured that the former inmates were never treated to anything as appealing as a bottomless Saturday brunch or perfectly-tender West Country lamb. If you’re tempted by these or any other unconventional accommodations, talk to your personal travel manager today.